Michael Gardner from the University of Essex moderated the session from Madrid, projecting Open Wonderland from his computer for the live audience to view. Carlos Delgado Kloos, one of the local hosts, did the first presentation, also live from Madrid. 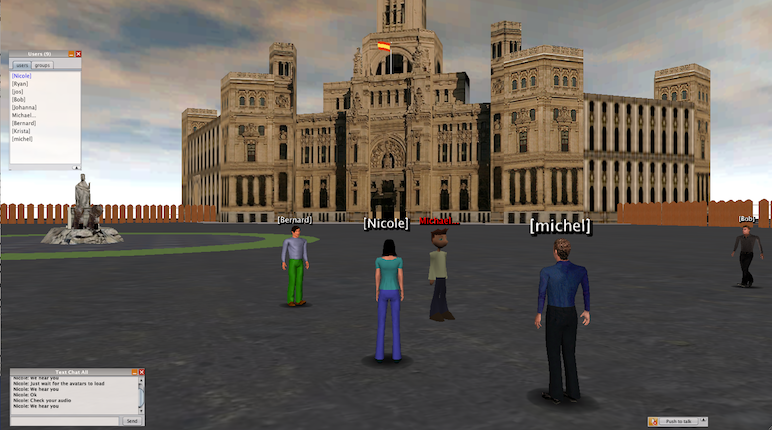 He talked about the Gran Via world created at University Carlos III de Madrid designed for Spanish language learning. Next the group moved to the iSocial Garden World space where Krista Galyen from the University of Missouri provided an overview of the iSocial project. She explained how this sample space, as well as many others they have developed, are used to teach social competence skills to children diagnosed with Autism Spectrum Disorders. Following Krista, iSocial’s lead developer, Ryan Babiuch, described a key module used in the iSocial project called the Sheet Suite. He played a Sheet Suite demo video in-world to illustrate how the system works. 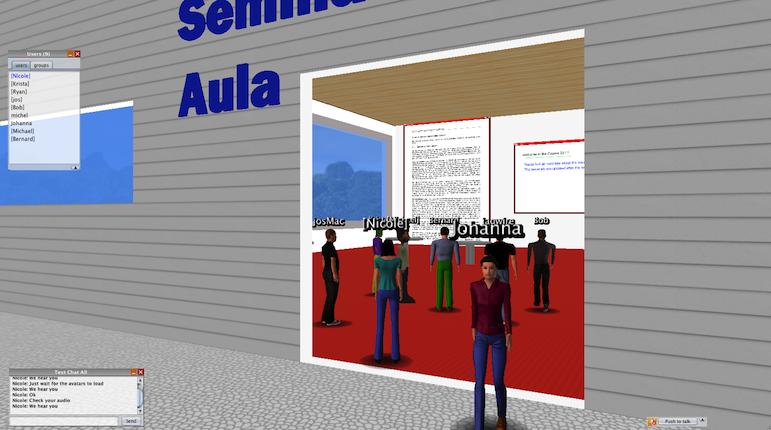 The Sheet Suite allows instructors to create multiple choice questions, open-ended questions, and other types of sheets that display in-world on the heads-up display. There is also a web tool for creating and managing sheets, as well as a reporting tool that aggregates sheet results and provides the ability to export the data to a spreadsheet. 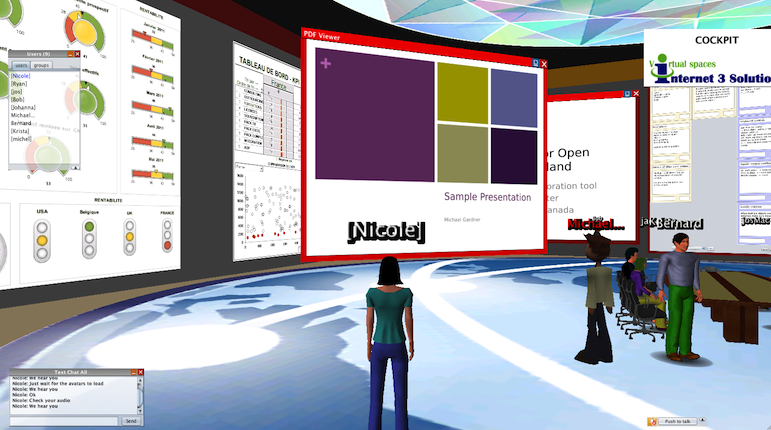 The University of Missouri has made the decision to open source this valuable tool for educators. When available, we will ask the team to write a detailed blog post on how to create and use sheets. Next on the tour was Johanna Pirker’s Environment for Startup Entrepreneurs. Johanna, a graduate student at the University of Graz in Austria, took us to visit the informal café space where entrepreneurs can get to know one another informally. She also showed us a space for creativity and brainstorming, and another for more formal presentations. 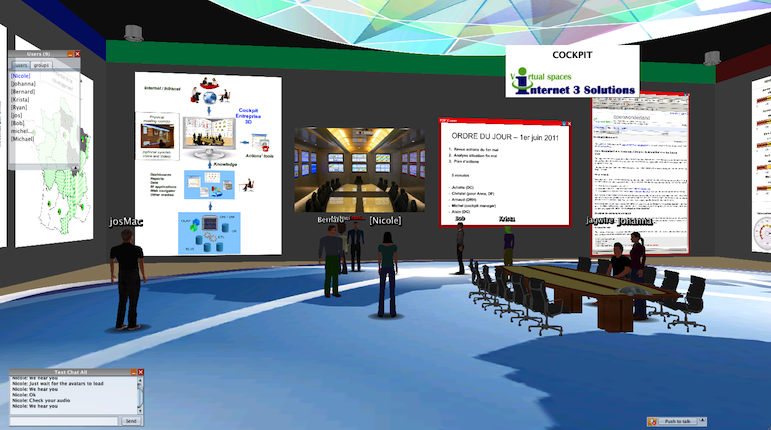 The final space we visited was the Cockpit 3D, introduced by Michel Denis from Internet 3 Solutions in France. In this room without doors, decision makers are immersed in data that can help them in the decision-making process. The attractive room design includes many different applications on the walls as well as a table that accommodates 10 seated avatars. We used this space to demonstrate a number of other projects. Bernard Horan from the University of Essex talked about two tools he has developed for the EU-funded +Spaces project. To show off the Office Converter, he asked Michael Gardner to drop a PowerPoint presentation into the world. This was converted, on the fly, to a PDF document that appeared in front of us. 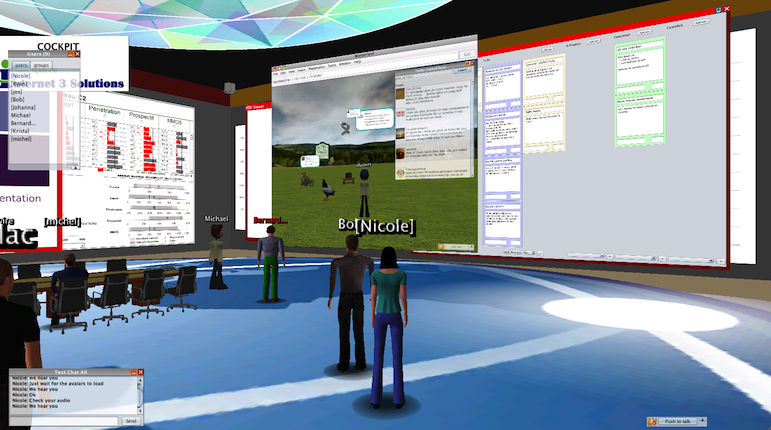 Bernard also described the Twitter Viewer, a tool that allows users to display a live twitter stream in-world. 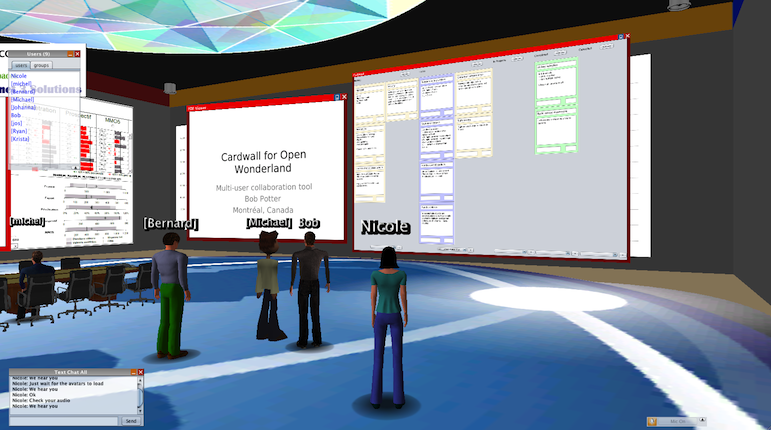 Next, Bob Potter, an agile programming enthusiast from Canada, demonstrated the Cardwall tool he developed initially to support the agile programming methodology. Based on people’s interest in using the tool for general brainstorming, he modified the Cardwall to make it more general. Now users can configure the wall with their own column headings and even pop sticky notes off the wall into the world. He has made his Cardwall presentation slides available for those wanting more information about the project. José Dominguez from Trinity College Dublin demonstrated two Wonderland Wednesday community projects. He had Michael Gardner demonstrate the Subsnapshot importer/exporter by dropping a basket of toys into the world that had been previously exported from a different Wonderland world. 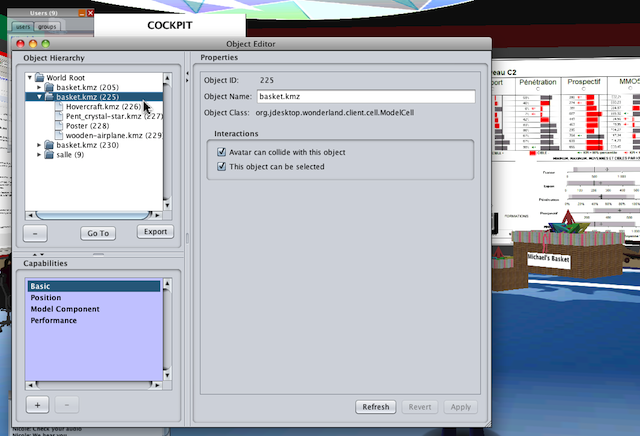 Opening the Object Editor window, Michael showed how the objects in the basket were children of the basket. By exporting the parent object, it is possible to make a backup copy of the items and save them on your own computer. Each of the four spaces demonstrated in this session were created using Subsnapshots. The world builders each exported their space and emailed me the resulting .wlexport file. I then dragged and dropped each .wlexport file onto the Community Server. This produced the four spaces, complete with applications and object properties. José also demonstrated EZMove, a tool for easily moving objects around in-world by holding down the ALT key and dragging. This project is still a work in progress, but should be available in the Module Warehouse as soon as the Wonderland Wednesday developers have a chance to polish up the code. The current version is installed on the Community Meeting Server for anyone who would like to try out the new functionality. We ended the session seated around the conference table for a Q&A session. Something must be in the air. In the past week, I have received three separate reports of lost Wonderland data. I highly recommend that everyone who is running a Wonderland server on which people are building original content institute a regular backup routine. Relying on your internet server provider to do this for you is a formula for disaster. The rest of this post describes three ways to create Wonderland backups. Using your favorite standard backup technique, back up this entire directory on a computer other than your Wonderland server. You can do this nightly, weekly, or monthly depending on how often changes are made on your server. This will back up absolutely everything you need to restore all your Wonderland data. If disaster strikes, as it did with one community member whose ISP was attacked by a hacker, you will be able to do a clean Wonderland install and then copy your backed up server directory to replace the default one. All your snapshots, user directories, artwork, custom modules and configuration modifications will be restored. Snapshots are a mechanism for saving the state of your Wonderland world. Instructions for creating and restoring snapshots is provided in the Manage Worlds section of the Open Wonderland Server Admin Console Guide. The snapshots themselves are small XML files that contain references to artwork and other data stored in the various user directories. These are handy for restoring the state of the world under normal conditions. Saving snapshots alone, however, is not enough to restore a world if you lose the data in the user directories. When you create a zip bundle using this technique, be sure to save it on a computer other than the Wonderland server machine. As described in a recent blog post, subsnapshots allow you to save portions of Wonderland worlds. The advantage of subsnapshots is that content developers without system administration access can create these backups. A subsnapshot creates a .wlcontent zip file that bundles all the artwork, apps, and object properties included in a “container” or parent object. Assuming you have the Subsnapshot module installed, creating a subsnapshot simply involves right clicking on a container object and selecting “export” from the context menu. The resulting .wlcontent file can be stored on your client machine. Unlike snapshots, which allow you to save your entire world no matter how much you have spread out the content, you can only make a subsnapshot of a single area. For example, to back up the default combined world, you would have to create six subsnapshots, one for each space. Please do not wait for the worst to happen. If you don’t already have a backup plan in place, create one right now. This could be as simple as putting a monthly reminder in your calendar to create subsnapshots of all your new work. If you have system administration skills, then write a script to back up your .wonderland-server directory on a regular schedule. One of the challenges of the +Spaces project is to provide our users with charts of the results from their participation in polls, debates and so on. In Wonderland, one way of doing this would be to create from scratch a new 2D Swing Cell that employs an existing open source Java library such as JFreeChart. This library seems to provide all the charts we need, including pie charts and bar charts. However, instead of starting from scratch it’s always easier to steal someone else’s ideas “stand on the shoulders of giants.” The “giants” in this case are Google, and their Chart API. The API returns a chart image in response to a URL GET or POST request, where the URL contains all the information about the chart you want, including its data, size and colours. By using such a URL in the HTML of a Poster cell, we can now easily create charts in Wonderland. For example, here is a very brief video of creating a poster to display the example chart that Google provides. The advantage of this approach over the Swing approach is flexibility: using a Poster means that we can embed a Chart in other text, and update the Poster programmatically or from the web. You are currently browsing the Wonderblog blog archives for November, 2011.